BARRIE, Ont. 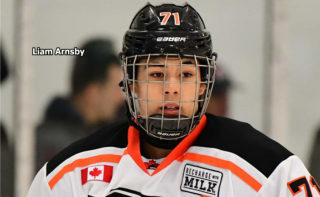 – Kevin Labanc scored on the power play at 13:08 of the third period to give the Barrie Colts a 3-2 victory over the North Bay Battalion in a penalty-filled Ontario Hockey League game Saturday night. The fourth of six games between the Central Division rivals saw the teams combine for 54 penalty minutes and 18 power plays, with the Colts capitalizing for three man-advantage goals. Brendan Lemieux and Garrett Hooey also scored for Barrie, which moved its won-lost-extended record to 9-8-2 for 20 points, four behind the division-leading Battalion, which has a game in hand. Goaltender Mackenzie Blackwood returned from an ankle injury, facing 32 shots in his first action since a 4-1 loss at North Bay on Oct. 13. 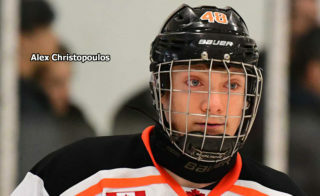 The Colts, who had been idle since an 8-3 road loss to the Sault Ste. Marie Greyhounds on Nov. 8, have dropped five of their last seven games and are 4-7-1 in their last 12. Nick Paul scored both North Bay goals before a crowd of 4,134, with Kyle Wood earning two assists. Goaltender Jake Smith faced 21 shots for the Battalion, 10-4-4. Paul brought the Troops, who trailed 2-1 after two periods, even at 1:14 of the third. Blackwood stopped a Wood shot from the right point but kicked the rebound to Paul, who converted from the lip of the crease for his team-leading 16th goal of the season. 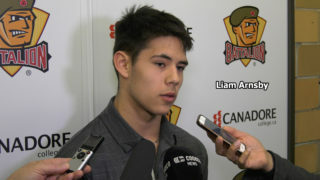 The Battalion failed to take advantage of two subsequent power plays occasioned by penalties to Joseph Blandisi, and the Colts couldn’t score after Hampus Olsson went off for tripping, but Barrie found the winner with Brenden Miller serving a roughing call. Shortly after Smith used his right arm to parry Labanc’s drive from the left-wing circle, Labanc rushed down the right wing and beat the goaltender high to the glove side. The Troops got a final power-play chance when Blandisi was whistled for high-sticking at 17:33 but couldn’t generate a scoring chance. Smith left for a sixth skater with 1:25 left, and the Colts narrowly missed an empty-net goal when Lemieux failed to catch up to a Michael Webster feed. Paul opened the scoring on the power play at 12:57 of the first period, driving to the net and slipping a Wood pass between Blackwood’s pads. The Colts, unable to generate a solid chance during a two-man advantage lasting 1:15, tested Smith in the 15th minute, with the goaltender getting his right arm on Justin Scott’s shot from the slot. The Battalion challenged Blackwood during an early power play, and Zach Bratina and Alex Henriksson had chances late in the frame with the Troops again enjoying a man advantage. Penalty trouble afflicted the Battalion in the second period, most notably when Miller collected six minutes in penalties at 14:46 on a minor for elbowing and a double minor for high-sticking. The Colts capitalized on the two-man advantage, tying the game nine seconds later when Lemieux redirected a shot from the blue line by Rasmus Andersson. With Barrie still on the power play, Hooey struck at 17:23. 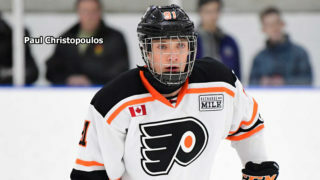 Webster lofted a shot from the blue line that hit the right leg of defender Marcus McIvor and landed on the stick of Hooey, who stuffed the puck home. Smith was tested during an earlier Barrie power play, but he produced several sparkling saves, the best when he slid across the crease to rob Hooey on a two-on-one rush with Blandisi. The Battalion, which defeated the visiting Peterborough Petes 7-2 Friday night, hosts the Mississauga Steelheads at 2 p.m. Sunday on BMO Fan Appreciation Day. BATTALION BULLETS: The Colts, celebrating their 20th season, honoured the late Bert Templeton, who coached Barrie for its first four seasons after 12 years with the North Bay Centennials … The Troops have won four of their last six games and six of their last nine. Their only other losses in that span were a 3-2 setback via shootout to the visiting Belleville Bulls on Oct. 30 and a last-minute 2-1 loss Nov. 6 at Peterborough … Paul has six goals in four games against Barrie … The Battalion, charged with 30 penalty minutes, went 1-for-7 on the power play. 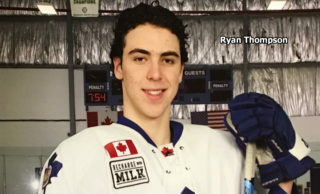 Barrie, sentenced to serve 24 minutes, was 3-for-11 … Opening line combinations included Paul centring Jared Steege on left wing and Mike Amadio on right wing, Brett McKenzie pivoting left winger Bratina and right winger Henriksson and Ray Huether centring left winger Mike Baird and right winger Mathew Santos. 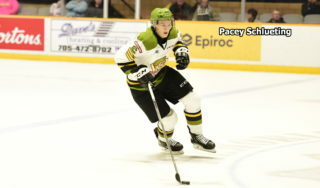 Zach Poirier centred left winger Owen Green and right winger Olsson … The Battalion scratched Riley Bruce, David Sherman, Mark Shoemaker and Calvin Gomes … Barrie’s Andrew Mangiapane, who earned two assists, has an eight-game points streak during which he has seven goals and 12 assists for 19 points. He saw the end of a four-game goals streak, during which he scored six goals, and extended an assists streak to eight games … The referees were Joe Celestin and Jason Faist.